The 47th edition of Miss Intercontinental will be held on 26th January 2018 where delegates from all over the globe will compete for the coveted crown in Manila, Philippines. Before the finale, the preliminary competitions were being held at the National Costume Competition was held two days ago. At the end of the event, Giuliana Valenzuela from Peru was awarded the title of Best in National Costume. Looking absolutely gorgeous, Karen wore a costume inspired by the Moryonan also known as the 'Moriones Festival'. It is a colourful festival celebrated on the island of Marinduque in the Philippines during the holy week. The ‘Moriones’ are men and women in costumes and masks replicating the garb of biblical Roman soldiers as interpreted by local folks. This festival also inspired the creation of other festivals in the Philippines where cultural practices or folk history is turned into street festivals. The Mythical bird 'Sarimanok' was also added to the whole ensemble making it more dramatic. Gabriela’s costume was inspired by Guarani language; this language crossed frontiers because of its beautiful cultural character. Through her costume, she showed the different ethnic groups of her country, represented with the caciques. The culture of Paraguay fused together with art, she carried with pride the Paraguayan flag simulating in the painting the Ñanduti and the national anthem in her native language, appreciating the choir. 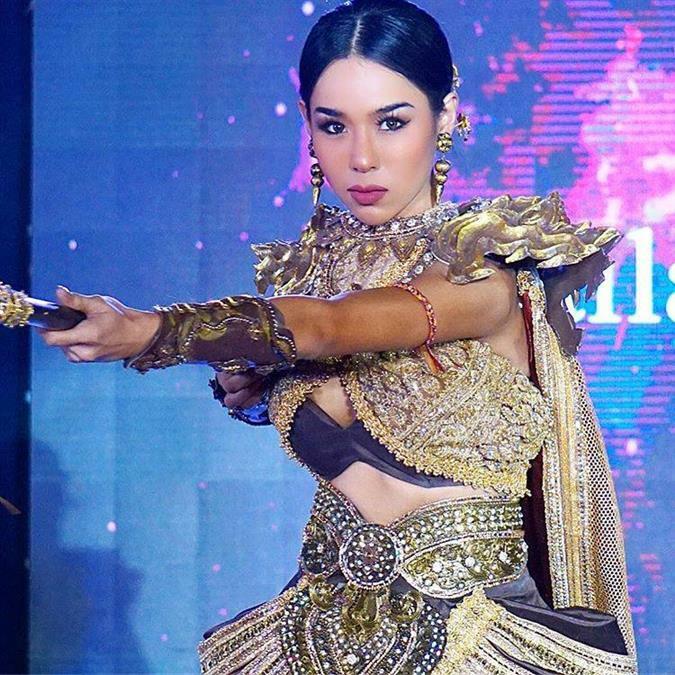 ‘Warrior of Bang Rachan’, Ingchanok Prasart represented the warrior women of Thailand. She looked absolutely gorgeous in her warrior costume and performed exceedingly well in the competition. 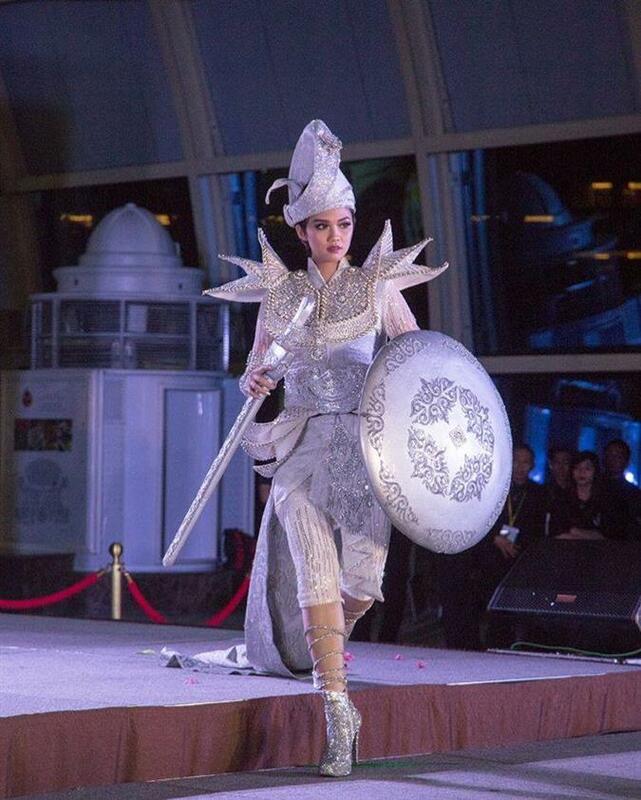 Carefully woven and every element set thoughtfully, Ingchanok Prasart’s costume definitely stood out. Not only did Giuliana performed with excellence, but she was also awarded the title of Best in National Costume. The National Costume of Peru’s delegate was also worn once in 2012 by Nicole Faveron but this time there a few changes made to imply fresh elements into it. 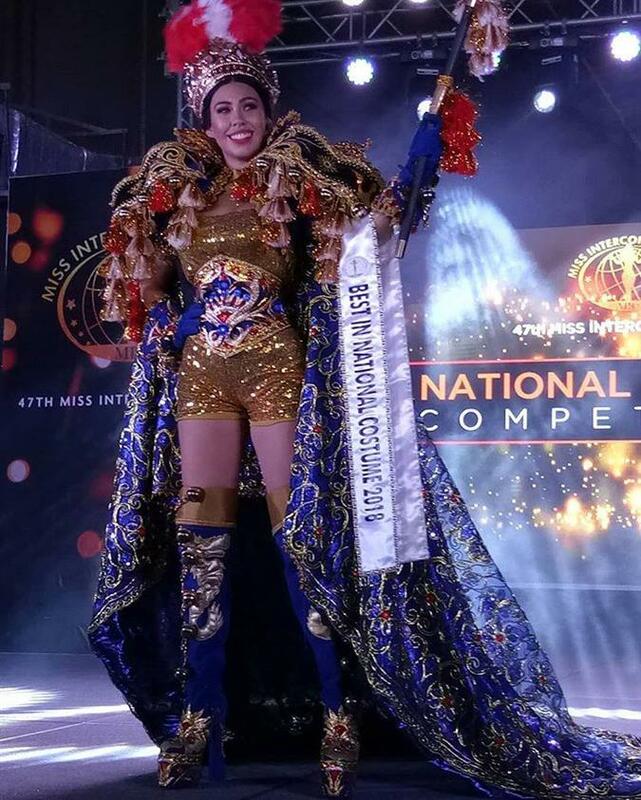 ‘Queen Morena Laykakota’, the costume, looked absolutely gorgeous on her as she definitely deserved her win. Inspired by the Flamingos of the Venezuelan coasts, Gina Bitorzoli Pinto wore a beautiful creation by Jonathan Marval Sarmiento. She looked absolutely gorgeous in her pink costume as the feathers also escalated the look of the whole costume. Kim Oprah wore the National Costume Inspired By the Super Eagles and The Nigeria Coat Of Arms. It was made by Jaru and the wings in her costume were made by Thread Fashion Couturier due to damages during transit. 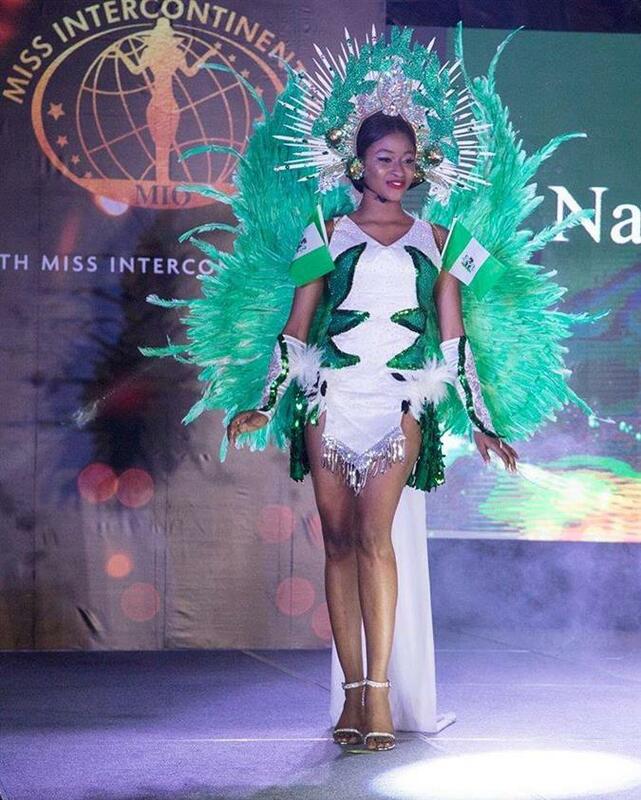 The gorgeous Nigerian beauty looked absolutely gorgeous in her green costume and was applauded greatly by the audience as well. Scarlett Megan wearing ‘Tun Fatimah’ proudly represented her country in the National Costume Competition. It was designed by Zamin Zawani as Scarlett walked the stage looking absolutely gorgeous. She walked the stage, confident and poised as she was welcomed with applause by the audience. Akari wore an interesting and unique costume as she smiled her way on the stage and mesmerized everyone. Akari wore a pink traditional costume with a pink headgear which she combined with a tradition umbrella of Japan. She looked absolutely beautiful and enchanted everyone. ‘A Glympse Of The Origin Of Nagini’ was the name of the national costume of Indonesia. This beautiful figure with a half snake body is known to be the strongest commander in the unseen kingdom of Saptapratala. Nagini was a human-headed snake who lived in the jewel-encrusted underground. It is the goddess of Bathara Antaboga. Another myth mentioned when the full moon, magic and beauty Nagini will reach its peak. It can easily transform into a beautiful lady figure. However, as the moon begins to shrink, it will naturally turn into gigantic snakes leaving some pieces of gold which is actually the scales of his snake. Wearing the traditional costume representing the indigenous population in the United States of America, Marianny Egurrola walked the stage looking confident. 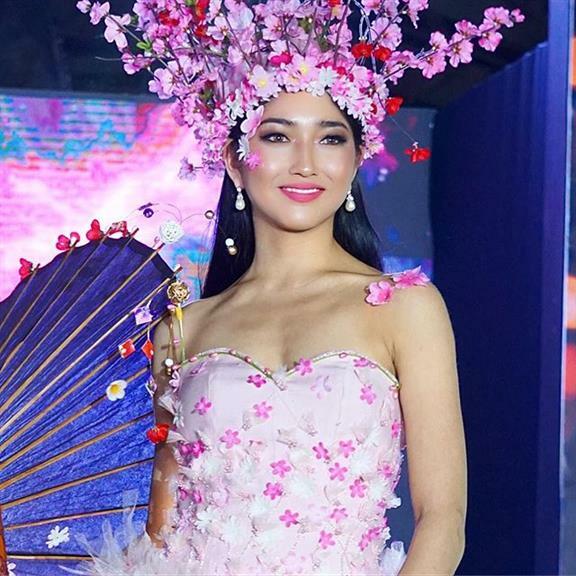 Even though she received a certain backlash from the people for not representing the indigenous population with respect through her costume, Marianny definitely showed poise and elegance.